This is the seventh of ten Blog posts I’m devoting to counting down The Top 10 Alive with Clive Highlights of 2011. In this Blog post, I discuss Highlight # 4 – The Launch of The Alive with Clive Gift Store! I announced this launch in a Blog post I published on December 20, 2011. To see this Blog post and the products available for sale in The Alive with Clive Gift Store, click here. Personally, I love looking at the products in the store, and look forward in the months ahead to adding, and selling, many more! For now the store does not exist on any street. It can be found only in cyberspace. And there is no inventory of products on hand for immediate shipment. 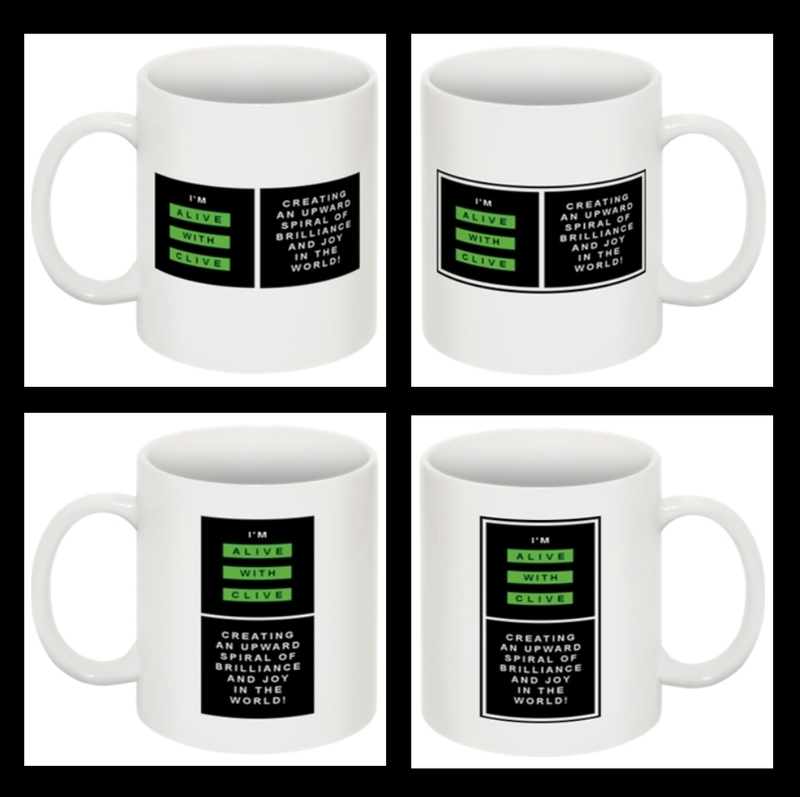 Nevertheless, all the products are available for order and, with the exception of the now famous “I’m Alive with Clive” T-shirt, will be delivered within four to six weeks from the time you place your order. At this stage, orders for the now famous “I’m Alive with Clive” T-shirt are filled after at least 24 T-shirt purchases have been made, so it may take longer for the T-shirts to be delivered. Nevertheless, to be in alignment with my promise for the world, which is to create an upward spiral of brilliance and joy in the world, why not order a product or a few from the store today? Also, if you’ve been stumped for a great idea for a gift lately, did you realize that these products make great gifts! If you have friends or family members who will be celebrating a birthday, anniversary or other momentous occasion within the next couple of months and place your order today, you will receive the products you order (including a batch of 24 T-shirts you could order) in time to give them away. Or, if you are in business and want to provide a phenomenal bonus or gift to encourage potential purchasers to take action, a product or products from The Alive with Clive Gift Store would be the perfect incentive! To visit The Alive with Clive Gift Store now, click here. I look forward to seeing your orders for products in The Alive with Clive Gift Store come gushing in in the weeks ahead. This entry was posted in Alive with Clive and tagged Alive with Clive, Alive with Clive Global Community, Alive with Clive T-shirt, anniversary, anniversary gift, birthday, birthday gift, gifts, HIV/AIDS, incentives, Set of 4 Alive with Clive Mugs, South Africa, The Alive with Clive Gift Store, Top 10 Alive with Clive Highlights of 2011. Bookmark the permalink.